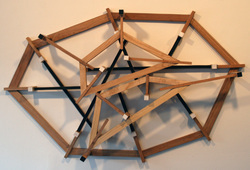 Janet Kurnatowski is pleased to present Parallel Modes, new works by Katsuhisa Sakai from February 26 – March 28, 2010. This will be Sakai’s second solo exhibition with the gallery. Please join the artist for an opening reception on Friday, February 26th from 7-9 pm. Throughout the 1980’s and 1990’s, Sakai’s geometric based wood constructions articu- lated objects that were structured as a continuous embodiment of space and mean- ing. In this show Sakai attempts to expose the correlation between four black and white paintings and four wooden wall sculptures. Even though the two bodies of work are created in different mediums they are executed in a parallel mode, both dealing with the concept of space and dimensionality. Katsuhisa Sakai was born in Japan, he received a BFA from Musashino Art College in Tokyo and a MFA from Yale University, School of Art. Sakai’s work includes experimental film, video, drawings and sculpture, shown in New York, Los Angeles, San Francisco, San Diego and Tokyo. For additional information or images please contact the gallery.